BAE Systems has received a $41.6 million contract from the U.S. Navy to modernize the guided-missile destroyer USS Oscar Austin (DDG 79). The Oscar Austin will undergo 12 months of extensive work at the company’s shipyard in Norfolk, Virginia, the ship’s homeport. The contract includes options that, if exercised, would bring the cumulative value to $117.1 million. Under the depot maintenance period (DMP) contract, BAE Systems will dry-dock the 509-foot-long Oscar Austin. 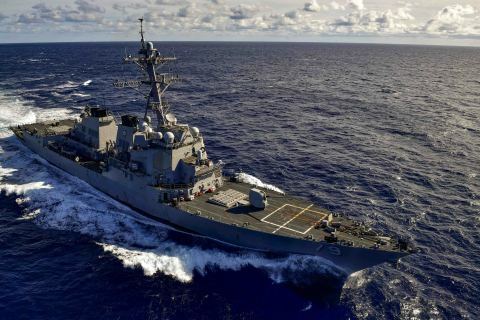 The shipyard’s employees and subcontractors will then upgrade the ship’s Aegis Combat System and will perform alterations and miscellaneous repairs that will affect nearly every onboard space. The work is expected to begin in February and be completed in February 2019. The Oscar Austin was commissioned in August 1990, and is named for a Vietnam War-era Medal of Honor recipient. The ship is the second guided-missile destroyer to undergo the extensive repair and upgrade work. BAE Systems’ shipyard in Jacksonville, Florida, is currently working on the first destroyer to undergo the DMP modernization, the USS Roosevelt (DDG 80). The company’s San Diego shipyard recently was awarded the first West Coast destroyer DMP contract for work on board the USS Howard (DDG 83). BAE Systems is a leading provider of ship repair, maintenance, modernization, conversion, and overhaul services for the Navy, other government agencies, and select commercial customers. The company operates five full-service shipyards in Alabama, California, Florida, Hawaii, and Virginia, and offers a highly skilled, experienced workforce, eight dry docks, and significant pier space and ship support services.